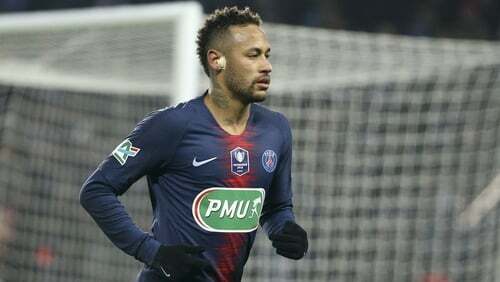 UEFA have charged Neymar for his angry social media comments about the penalty awarded to Manchester United during their Champions League victory over Paris St Germain on 6 March. A spot-kick scored by Marcus Rashford in the fourth minute of second-half stoppage time secured a 3-1 away victory for United, who progressed on away goals to the quarter-finals at PSG's expense. The penalty was awarded by VAR after Diogo Dalot's shot struck Presnel Kimpembe on the arm, but Neymar was adamant the spot-kick should not have been given. In a social media post, the 27-year-old, who missed both legs through injury, wrote: "This is a disgrace, they put four people that know nothing about football in charge of looking at the replay for VAR. There is no penalty. How can it be a handball when it hits his back! Go f**k yourselves!" UEFA confirmed in a statement on Friday afternoon that Neymar had been charged under Article 15 (1) (d) of the disciplinary regulations with "insulting / molesting acts against match official (statements made by the player following the above-mentioned match)". The date for the case to be dealt with has yet to be confirmed.